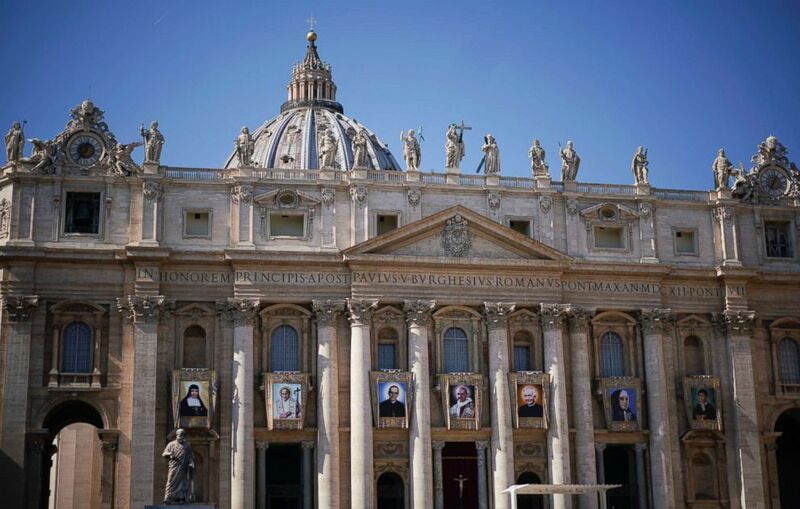 The embroidered banner-portraits of the seven people Pope Francis will proclaim saints already hang on the façade of Saint Peter’s Basilica ahead of the solemn ceremony Sunday. 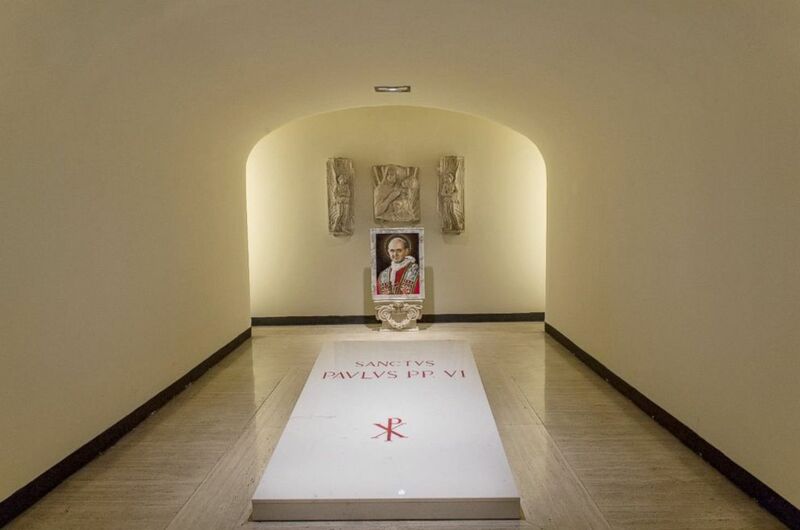 The new tombstone and mosaic portrait of one of them, Pope Paul VI, the somber, timid pope of the turbulent 60s, is already in place in the crypt of St. Peter’s with his title changed from “Beatus” (blessed) to “Sanctus” (saint) above his name. Among those who will be canonized Sunday with Pope Paul are four religious figures: Mother Catherine Kasper, the German founder of a religious congregation; Nazaria Ignacia March Mesa, the Spanish founder of another order; and two Italian priests, Father Francesco Spinelli and Father Vincenzo Romano. The tapestries of Roman Catholic Archbishop Oscar Romero, left, and Pope Paul VI hang from a balcony of the facade of St. Peter’s Basilica at the Vatican, Oct. 13, 2018. Added to the list in July, after the ceremony had already been announced, is a teenager, Blessed Nunzio Sulprizio, who died in Naples in 1836 at the age of 19 after a life of pain and suffering. This high church ceremony is taking place during the month-long synod of bishops in the Vatican, which has gathered over 200 bishops, including about 50 cardinals, and nearly 40 young people to discuss youth, faith and vocations. Sulprizio was beatified — the first step to sainthood — by Pope Paul VI in 1963, and they will both become saints in the same ceremony. The tomb of Pope Paul VI inside St Peter’s Basilica at the Vatican is pictured on Oct. 12, 2018. But the focus of many attending the ceremony will be on Archbishop Oscar Romero of El Salvador, who was murdered in March 1980 while celebrating mass in his church. Nobody was ever convicted for the crime but strong evidence indicates he was assassinated by an extreme right-wing death squad. Romero is already revered as a saint and hero by Catholics across the Americas and around the world. A large crowd of about 7,000 Salvadorans have come to the Vatican for the vigil ceremony Saturday night and canonization ceremony Sunday. Celebrations are also planned in El Salvador and in other cities around the world especially in Los Angeles, which has the largest community of Salvadorans outside the country. Romero is considered to be a hero of the church of the poor as he spoke out against social injustice and violence during a time of deep upheaval and divisions in his country. A crowd of more than 100,000 people were attending Romero’s funeral when the military fired on the crowd, killing dozens of mourners. Romero’s sainthood cause, which was started in 1997, had been blocked for years during the papacies of Popes John Paul II and Benedict XVI by the Roman curia and South American cardinals for political and theological reasons. Francis, the first Pope from the Americas, formally decreed in 2015 that Romero had been assassinated as a martyr and Romero was beatified in San Salvador in May of that year. Recognizing Romero as a martyr-saint will probably lead to the canonization of other murdered Latin American bishops including Enrique Angelelli, assassinated in 1976 during Argentina’s military dictatorship. The tapestries of Roman Catholic Archbishop Oscar Romero, 3rd from left, and Pope Paul VI, 4th from left, hang from a balcony of the facade of St. Peter’s Basilica at the Vatican, Oct. 13, 2018. Both Pope Paul and Romero are very significant figures for the present Pontiff and Pope Paul VI was the pope during Romero’s life. He was also Pope during Francis’ youth and that of many of the older bishops and cardinals gathered in the Vatican for the synod. 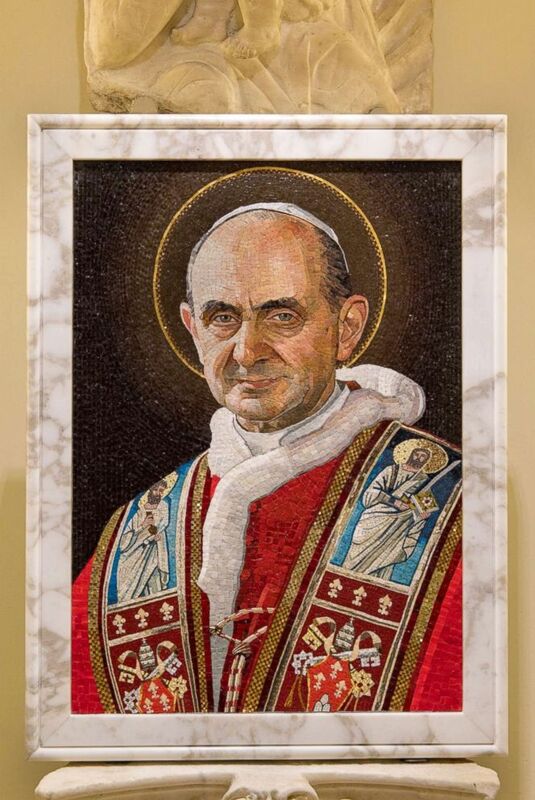 Pope Paul VI is mainly remembered as the Pope who closed the Second Vatican Council in 1965, followed through with the reforms of the Catholic church and for his encyclical Humanae Vitae, published in 1968, which spelled out the Catholic position on birth control. He was also known for his attention to the church in Latin America and for his focus on helping the poor.